Today's farmers need test tubes, calling on bespoke scientific glass blowers . 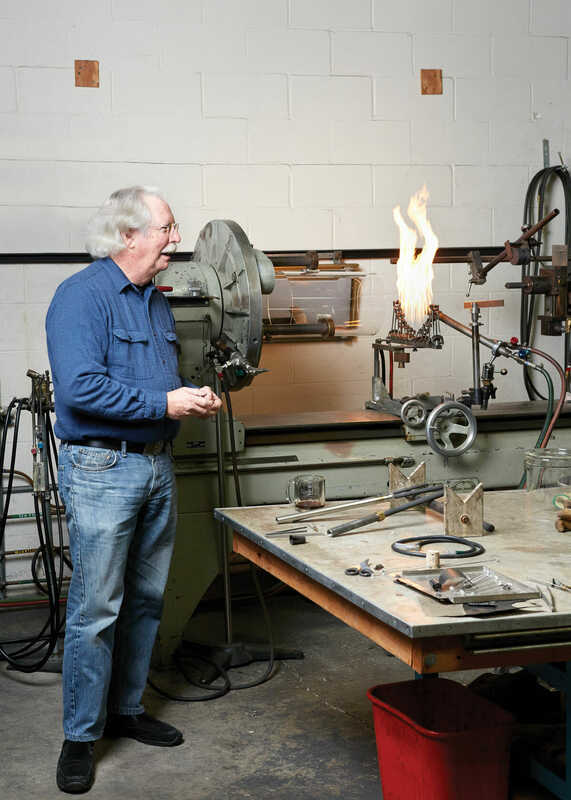 Adams & Chittenden, a scientific glassblowing company in Berkeley, California, have been in business since 1993. Various pieces, including a rotovap condenser (center left), used during the removal of solvents. Bob Ponton doesn’t mean any offense to legendary astronomer Galileo Galilei. Not really. Ponton may be a bit biased, as the former president of the American Scientific Glassblowers Society, but he’s not wrong. 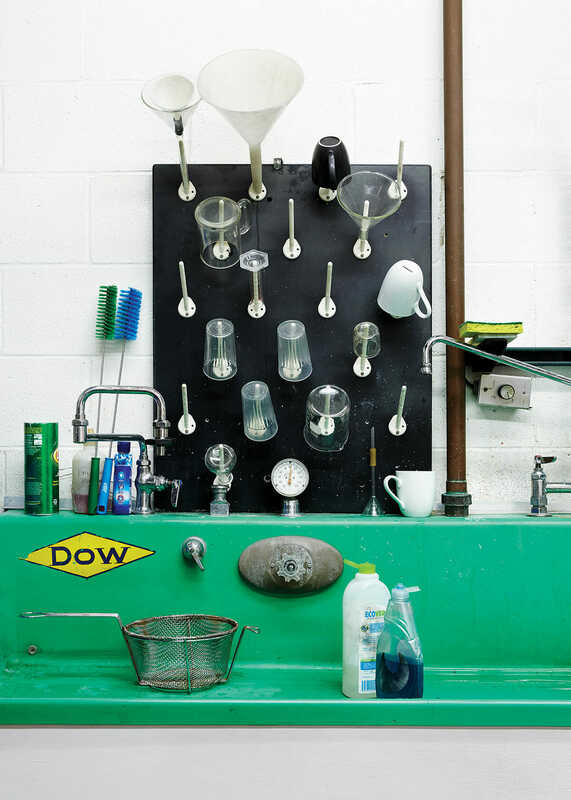 From milk production to cloning, scientific glassblowers build the complicated contraptions that make science – and modern agriculture – happen. Glass might seem like an old-fashioned choice for cutting-edge farming techniques, but scientists love that it’s malleable, hygienic, transparent and durable. 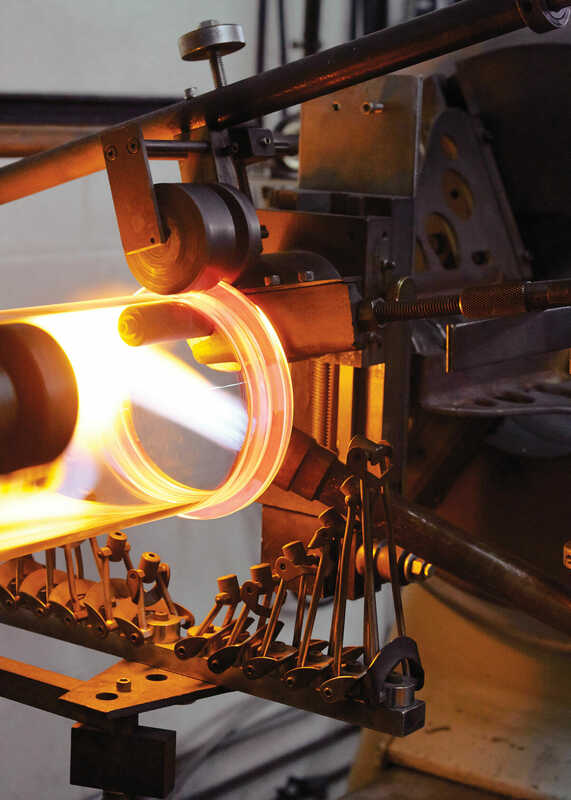 Working with lathes, torches and flames reaching 3,000 degrees Fahrenheit, glass technicians bend and pull hot glass like taffy, creating glass apparatuses, many with several different parts. Glass might seem like an old-fashioned choice for cutting-edge farming techniques like cloning, but scientists love that it’s malleable, hygienic, transparent and able to withstand a wide range of conditions and chemical combinations. Perhaps it’s no surprise then, that the skills of glassblowers are in demand on the farm. After all, some of the earliest scientific breakthroughs were inspired by agriculture. Louis Pasteur, anyone? “I’d been working in agriculture for a number of years and then accidentally became an embryologist,” says Bill Ritchie during a fuzzy video chat beamed from India. He’s a long way from Scotland, where he was part of the famed team that made Dolly the cloned sheep, born in Edinburgh in 1996. Ritchie enjoys the distinction of being the scientist who removed the microscopic cells that would eventually be implanted in a surrogate, giving rise to the renowned ruminant. But before he could do so, he learned glassblowing. Tom Adams with a glassblowing lathe and crossfire. Ritchie practiced for hours, creating piles of pipettes for holding on to a microscopic egg and stacks of sharpened pipettes to remove chromosomes from the egg, like a vaudevillian being yanked from the stage. Just how small were these tools? Suggest a strand of spaghetti, and wait for the laughter to subside. The pipette that extracted the chromosomes for Dolly was 18 microns, or 18 thousandths of a millimeter. The bespoke nature of these tools is no fluke. Many scientific glassblowers create one-off pieces that begin as notions. “Sometimes it’s a total PBI – a ‘partly baked idea,’” says glassblower Tom Adams, who has a robust white mustache and belly laugh. Together with his business partner, George Chittenden, he runs a highly regarded scientific glass shop, Adams & Chittenden Scientific Glass, in the hippie haven of Berkeley, California. They supply all sorts of industries, especially the Bay Area’s booming biotech scene. They’ve also been tapped to make specialized distillery devices and brewing apparatuses for coffee freaks. And they’ve hit on a sweet spot in one of California’s other high-profile businesses: wine. Ali Kamburov works on an apparatus called an H-Cell, used for electrochemistry. Among the creations they make for this industry is a thing called a Cash Still (aka, a Volatile Acid Still or an RD80). About 16 inches tall, it’s comprised of a funnel, a bulbous- bottomed container and a tightly coiled spring of glass, like a waterpark slide in miniature, all connected by highways of tubes, with a few valves thrown in. When plugged into the wall, an interior metal coil heats water, creating steam that distills volatile acid from wine samples. In the end, the acidity of the wine is revealed. Too much acid and the wine may be host to yeast-generated acids that will spoil it. This test is required by law, and a still for performing it will set a winemaker back $590. 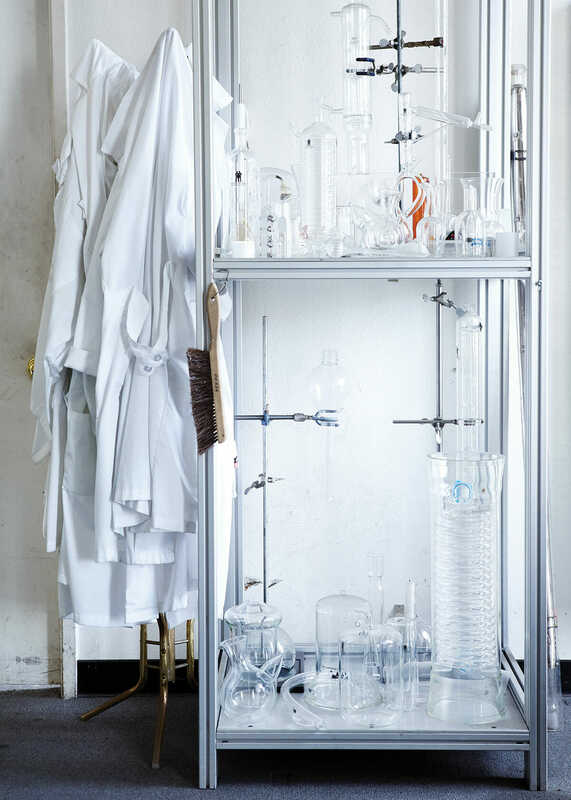 Like many scientific glass apparatuses, the Cash Still is made up of several different parts. 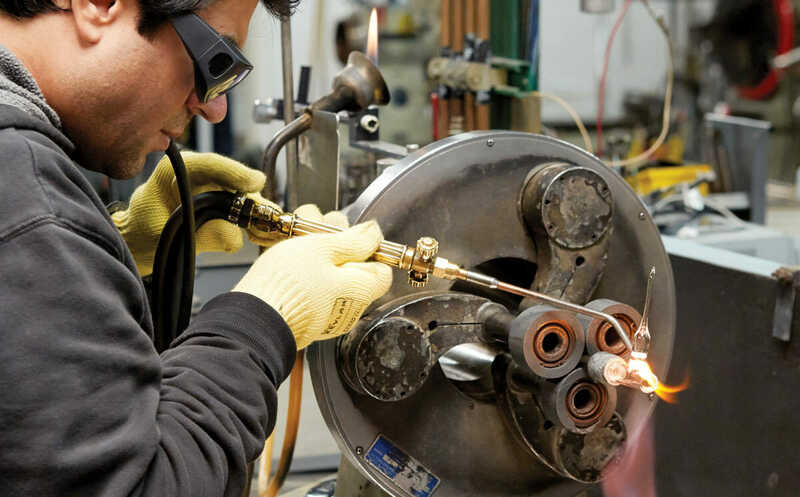 Glass technicians work with premade tubes, flasks, discs and other basics, heating them, manipulating them and essentially welding them together with fire. Adams says it can take five years to learn how to make a Cash Still, and that the work of as many as four glassblowers goes into each piece. It can take five years to learn how to make a Cash Still, and the work of as many as four glassblowers goes into each piece. 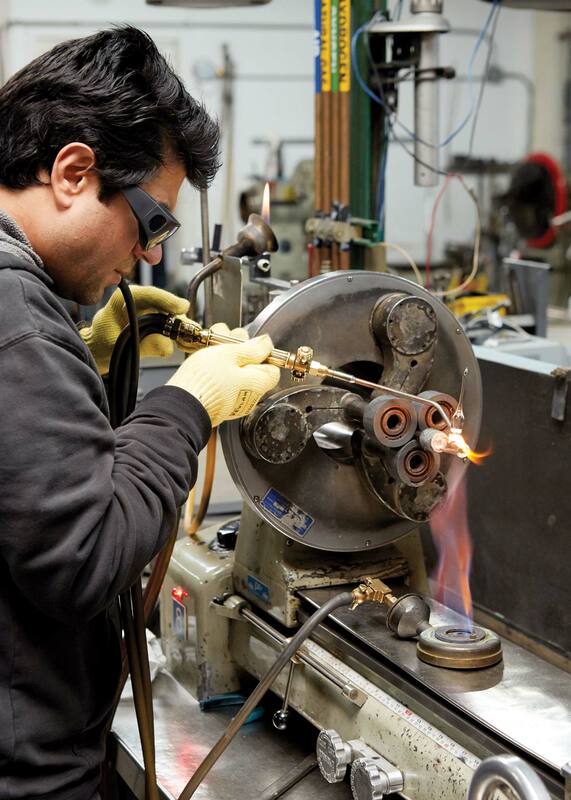 Becoming a scientific glassblower takes years of hands-on practice. Many learn in informal apprenticeships at places like Adams & Chittenden. Open calls for new employees, however, return mixed results. “Every time we put an ad out, we get a lot of calls from bong-makers,” says Adams. Bong-making is its own world, with annual conventions and competitions, and pieces that command hundreds of dollars. Tooling a flange (which provides strength and/or allows for attachment of another object) for a bioreactor. Display cabinet in the office with examples of Adams & Chittenden's work. The glass-washing sink with glassware drying rack above. The sink was originally used for photographic developing. In recent years, Briening says he’s seen an uptick in interest in scientific glassblowing. He recently doubled enrollment in his program from 22 students to 44. Much of the work glass technicians do simply can’t be automated. Much of the work glass technicians do simply can’t be automated. Chris Sprague, a second-generation scientific glassblower in Michigan, has always had steady work repairing glass dairy jars used during milking. Lots of farmers have switched to stainless steel, but many still use glass, both to avoid the cost of upgrading and for reasons the casual shopper would probably rather remain blissfully unaware of. “They can see if there’s blood or any kind of contaminants coming in from the cow,” says Sprague. Which is not to say there aren’t innovations. Ritchie, for instance, was in India to inspect a glass factory churning out products for his new business, Monash Biomed. His company is a member of the “micro-manipulation” industry – the business of performing procedures that happen on a minute scale, typically under a microscope. The apparatuses are based on those he made during his Dolly days, but have found their way into the human bedroom. Ritchie’s micropipettes have been used for in vitro fertilization. Despite ever-evolving technology, scientific glassblowers are members of a shrinking group: people who work with their hands and don’t have to worry about being replaced by robots. Ponton didn’t think twice about encouraging his son to become a scientific glassblower. “I don’t think it’s ever going to go away,” he says.